The goal of egg freezing is to arrest all metabolic activity inside the cell by submerging it into a very cold environment. This will effectively stop the biologic clock by suspending further egg development until it is time for egg thawing. In fact, a frozen egg may hypothetically remain in the state of suspended animation indefinitely. The tricky part is minimizing damage to the organelles by avoiding crystallization in the water component of the egg. 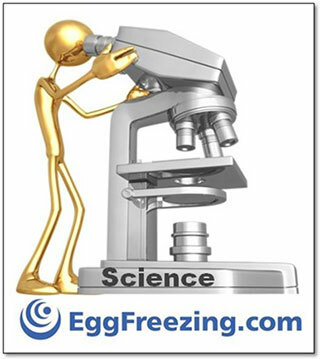 The science of cryobiology is the art of carefully transporting the egg’s internal cell water (dehydration) in exchange for the protective “anti-freeze”. Frozen Egg Bank Inc uses specially formulated solutions to perform this process thus shielding the internal structures from physical or osmotic damage. The human egg cell is truly a marvel of molecular engineering designed to replicate the egg’s DNA and to merge with the sperm DNA. The newly formed embryo may then carry the characteristics of the parental cells. 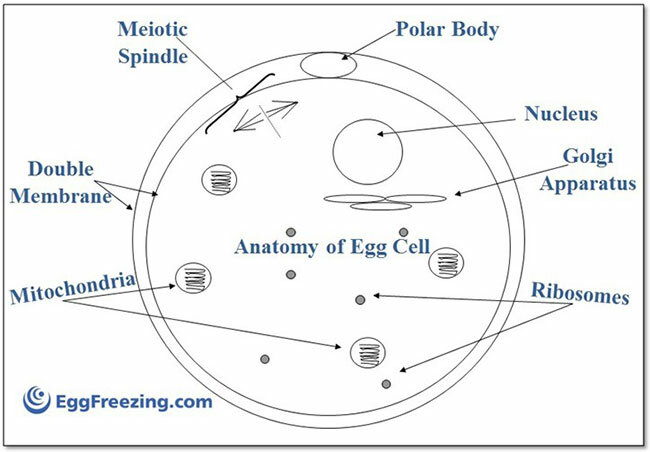 This image shows the anatomy of a human egg cell displaying the different types of cellular organelles that must be preserved during cryopreservation. 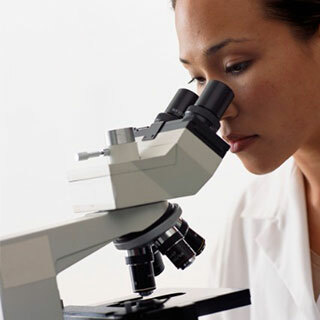 Measuring about 80 microns in diameter, the egg or oocyte, is the largest cell in the human body composed of 90% water with the remaining 10% carrying the molecular building blocks and the genetic code which lead to cell replication. There are thousands of tiny organelles located inside the egg’s fluid, each performing highly specialized functions as the egg carries out its normal activities. Critical among these is the fragile cytoskeleton and microtubules which form the so called spindle apparatus. This highly specialized structure orchestrates the delicate process of chromosomal alignment and replication so that all the descendants of the parent cell carry the identical number of chromosomes. Any disturbance of this crucial function results in a chromosomally abnormal embryo leading to failure of implantation, pregnancy loss or the birth of a child with chromosomal illness such as Down Syndrome. Does Egg Freezing Work for All Women? Needless to say not all eggs will be equally as tolerant during the rigors of egg freezing and some may be more susceptible to damage than others. Furthermore, at the time the eggs are harvested they may already be chromosomally abnormal which will lead to inadvertent preserving of the abnormality. Unfortunately this cannot be anticipated ahead of time, which further explains why not all eggs, fresh or frozen, may lead to a healthy pregnancy.